A train wreck or train crash is a type of disaster involving one or more trains. Train wrecks often occur as a result of miscommunication, as when a moving train meets another train on the same track; or an accident, such as when a train wheel jumps off a track in a derailment; or when a boiler explosion occurs. The answers beg the question: Is Obamacare a Train Wreck? As a point of contention, the Republican-led House of Representative (2013) took a political position of challenging the funding of President Obama’s signature health care initiative as a preamble to the legislative roll call vote to pass a federal government funding and/or debt ceiling limit bill. As widely reported, the president responded with a “no negotiation” response. For starters, the beginning of federal government involvement into socialized medical care entitlement (as we know it) found its way into the American way of life with the FDR Presidency. President Roosevelt issued in a New Deal …one of an economic social safety net with the advancing of the Social Security Administration and social benefits for retirees and disabled citizens. As time went on, President LBJ introduced a law to provide economic help with medical expenses for U.S. citizenry. That entitlement, known as Medicare, was signed into law in 1965. President G.W. Bush expanded Medicare in 2003 with the signing of the Medicare Modernization Act (MMA) which is commonly known as the Part D prescription drug plan. Once thought to be an entitlement of enormous public disdain and a potential economic burden, the Medicare Part D entitlement is now seen as a benefit that is a managed care success…popular with both Democrats and Republicans alike. MMA was believed to have been a potential disaster during its conception and infancy – a train wreck waiting to happen – yet this was not the case. The roll out began in earnest in 2006; the benefit is a resounding success in 2013…roughly 10 years post-legislation. Physicians and hospital operate under partnerships with private insurance companies, state government, and the federal government. Other than indigent persons (not verified ability to pay for service), the medical community depends on reimbursement for service. The infinitesimal percentage of wealthy persons that engage in private fee for service cannot sustain the medical profession’s need for a billable fee schedule. Insurance companies along with [State] Medicaid and [Federal] Medicare reimbursements are the ways that managed care operates in this country. According to Medicare.gov, the Centers for Medicare & Medicaid Services (CMS), a branch of the Department of Health and Human Services (HHS), is the federal agency that runs the Medicare Program and monitors Medicaid programs offered by each state. In 2011, Medicare covered 48.7 million people. Total expenditures in 2011 were $549.1 billion. This money comes from the Medicare Trust Funds. Medicare is a very popular entitlement for eligible individuals. Medicare is a political sacred cow. Even staunch conservative fiscal hawks view Medicare entitlement as a property right. Yet how odd is it that these same said persons see Obamacare as a Train-Wreck. Can Obamacare one day become the golden child entitlement of both left and right wing politics? The Democrat-controlled House of Representatives along with a Dem-Senate rammed the Affordable Care Act (ACA) through the chambers up to the White House in year 2010. Republicans were not supportive for numerous reasons. Moreover, whatever the case, Republicans were perhaps naturally resentful of the politics of the Law’s passage. Regaining the House shortly thereafter, Republicans have introduced, voted, and challenged ACA (aka Obamacare) 40 times over a three year period. The negative economic ramifications of the Law are mired in fact, fiction, opinion, and bias. Obamacare is the enemy of small business (50 employees or less). Obamacare is unfair to those that are self-employed, retiree/pensioners, and the middle class. Obamacare is grossly unpopular with the majority of constituents, both Republicans as well as Democrats. Obamacare is a Bad Law! Obamacare is a Train Wreck. Obamacare is disliked because Barack Obama is disliked. Rather than debate the facts and/or perceptions, it is widely known that the Public hears what they believe…they believe what they hear. Researching the economics and the meritocracy of ACA would not sway those opinions to a noticeable degree. The one component of the argument is that the nation does have concerns about ACA’s affect upon job growth. Will Obamacare indeed become the Train Wreck of job creation and stability? The truth of the matter is that small businesses are exempt from ACA. Large businesses (over 50 employees) will need to implement ACA by year 2015. The Obama administration granted a one year extension to the mandate for large business due to the concerted consensus of the business community. For many, employer-sponsored health insurance is the only path to accessing the health care system. The factors of employment status, selective risk, and/or affordability are the key roadblocks to citizens being insured or insurable. The ACA (aka Obamacare) has several moving parts. 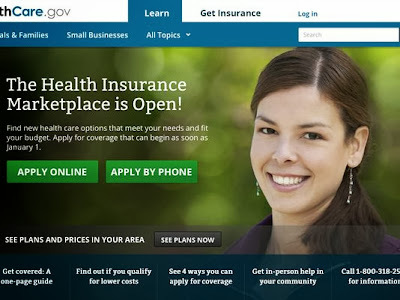 Many of us are most familiar with the disappointing rollout of the Healthcare.gov website. Politicians, the media, as well as the president have expressed disapproval and concern with the inability of the site to handle the traffic demands of persons wanting to access the information. In an October 2013 CNN blog post it was reported that the president was not going to sugarcoat his dissatisfaction with the site itself. "Nobody's madder than me about the website not working as well as it should, which means it's going to get fixed," Obama said during an appearance at the White House Rose Garden. But he didn't specify exactly what went wrong or who was to blame for the problems, which include long waits to log onto the federally administered website and maddeningly long wait times once online. There's "no excuse for the problems," Obama said. Accessing the site tonight (10-25-13), I had no problems gaining access. Since I currently have insurance, I wanted to know about how Obamacare would affect my coverage. The answers on the site were positively surprising. As with many Americans, I too am concerned with privacy and protection. In my mind, having the government’s hand in my medical care is already a past occurrence. Managed care, being what it is, is already run by insurance companies along with state and federal agencies. The cool thing is that eligible persons with preexisting conditions and protections for women are inclusive components of ACA. Republicans hate Obamacare, yet haven’t presented an alternative solution to remedy the plight of America’s uninsured. Representative (Rep-CA) Darrell Issa floated the idea that health care access for the masses be covered under the Federal Employee Health Care system as an alternative to Obamacare. Hmm…pensions plan that is an employer-sponsored program for +1 million persons become a national health care default program for 40 million persons? Uh, no…don’t think so. ACA is the law of the land. For now, eligible persons must enroll into the ACA program via telephone call center operators. Eventually, the website will be fixed (see Examiner.com article 10-25-13). Millions of persons will get in and enroll. States such as California, Kentucky, and Iowa are already seeing early success on their state-sponsored health exchange websites and programs. The shame is that many state opted to stand aside and have the federal government set up the health exchange. Were they hoping that the effort would fail? States can do a better job with providing services for its’ citizenry. Managed care is health insurance; insurance regulation and policy is under the jurisdiction of the states rather than the federal government. The health care law would be best served by having federal funding with state-by-state execution and administration. No--Obamacare is Not a Train Wreck. The apathy and intentional sabotage by opposing political factions that are more concerned with their self-serving agenda rather than providing for the wellbeing of its’ citizenry is the Real Train Wreck!